Formed around 6,000 years ago by a build up of sand sediments, animal and coral deposits, Green Island has become home to a diverse range of flora and fauna. This ancient coral cay is very unique indeed, out of the 300 sand cays on the Great Barrier Reef, it is the only one with a rainforest. Wunyami (Green Island and surrounding reef) is within the sea country of the Guru-Gulu Gungandji Aboriginal people and holds traditional and contemporary cultural significance for them. They have lived in this area for thousands of years. In times of lower sea levels, the Gungandji hunted and gathered on the grassy plains of ancient reef formations, right out to the edge of the present-day barrier reef. Then, when sea levels rose and Green Island reef had developed, they paddled to the island in canoes for hunting and ceremonies. The island was traditionally used as an initiation site for young Aboriginal men. To them the island is named Wunyami, meaning 'a place of spirits', or Dabuukji, 'the place of the hole in the nose'. Dabuukji, as a name, may refer to the island having been within local Aboriginal mythology and history a larger island with a freshwater marsh or 'hole' (later a well) at its centre. Alternatively it may be a reference to the story of the turtle which first obtained holes in its nose (nostrils) on this coral cay. It may also be a reference to some aspect of young Gungganyji male initiation rituals reported to have been conducted on this coral cay in times past. There is a strong chance the name alludes to all three of the above, in combination. Today, the Guru-Gulu Gungandji retain a strong spiritual connection with their country and have an active voice in managing the island. In 1770 Captain James Cook sailed past Green Island onboard the HMS Endeavour and recorded on his chart ‘a low green woody island...’ naming the island after his ship's astronomer, Mr Charles Green. Green Island was not settled by non-Indigenous people until the mid-1800s, and since then many different groups have relied on Green Island. In 1857, the first of many beche-de-mer fishing stations was established on the island. The beche de mer was boiled on the island, dried in the smoke house, and stored for market. The work was demanding, conditions harsh and the island took on a frontier-like atmosphere as vegetation was cut down. By 1889 there were several Fijian style grass huts erected on the island, and it became the favourite excursion place from Cairns for a typical men's weekend hunting and fishing. Green Island’s reputation continued to grow and by 1890 the vessel Zeus was running regular pleasure cruises between the mainland and Green Island. In 1924 a local company, called Hayles (now Great Adventures), started a fortnightly passenger ferry service from Cairns. A wooden jetty was built several years later, and in 1938, the first resort was built. The world's first glass bottom boat was launched at Green Island in 1937 by the Hayles company. It was a simple small wooden dinghy with glass floats overhanging the sides. This boat was quite the novelty – it was the first time that visitors could view the reef without getting wet. By 1948 a more modern version of the glass bottom boat was introduced – it had glass panels inserted into the floorboards, so people could look straight down on top of the reef without hanging over the sides. From the late 1940s, international tourism began to develop. The world’s first underwater observatory was the vision of two local men - Vince Vlasoff and Lloyd Grigg. Construction started in June 1953 and took over a year to complete. 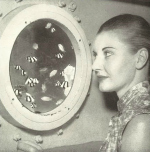 They used an old Navy dive chamber for the main chamber and the 22 portholes (with 2.7 cm, or 11/8 inch, thick glass) were recycled from a ecommissioned WWII submarine. The chamber walls are 1 cm (3/8 inch) steel plate reinforced with 24 cm (10 inch) steel girders, and are encased inside and out with (12.5 cm (5 inches) ferro-concrete. The entire structure was designed to withstand up to 96,000 lbs of pressure and is held in place by steel pins and sea anchors driven into the reef. Getting the structure to Green Island was a challenge - it took over 18 hours, travelling at 1 knot, to tow the observatory the 27 km from Cairns. Noel & Kitty Monkman were among the first photographers to venture underwater in the 1930s. They spent years videoing the underwater wonders of the Great Barrier Reef. In 1961 they opened the world’s first movie theatre on an island - the Green Island Great Barrier Reef Theatre. Pioneering underwater films such as "Typhoon Treasure" were shown daily, and it remained in use until the early 1990s. A stone monument to the Monkmans for their contribution to reef awareness and the conservation of Green Island is located on the island near the research station. 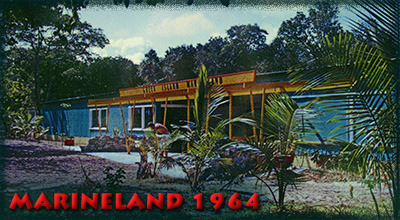 Another tourist attraction to open was Marineland Melanesia in 1961. Marineland Melanesia is a family owned and operated business showcasing one of the world's largest collections of Melanesian Tribal Artifacts, an amazing display of Aquariums, and Cassius the Island's king saltwater crocodile at 5.48 metres. In 1963 the Hayles company opened the Coral Cay Hotel which was enjoyed by many visitors, both local and international, until 1994 when the present resort was built. In conjunction with the multi-million dollar redevelopment a state-of-the-art tertiary sewage treatment plant was constructed. The system was the ‘first of its kind’ used on any island in Australia and has won many environmental awards. Pre 1770 Local Aboriginal tribes (Gungandji and Mandingalbay) used Green Island and its reef for fishing, hunting, and manhood initiation ceremonies. 1770 Captain Cook first marked Green Island on the navigational charts and named it after the astronomer onboard, Charles Green. 1857 A bech-de-mer (sea cucumber) smoking station was established on Green Island. It was operated by a fisherman called JSV Mein, and operated for several decades before closing down. 1863 A ship called the ‘Antagonist’ shipwrecked on Green Island reef while carrying horses to India (14 May 1863). 1889 Coconuts were planted to provide shelter, food and drink for shipwrecked sailors. Grass hut accommodation was constructed for fishing and hunting parties. 1890 The first organised pleasure cruises to Green Island commenced on a local coaster called ‘Zeus’. 1906 Green Island was declared a Recreational Reserve under the Cairns Council. The first public jetty was constructed. 1924 Hayles commenced fortnightly passenger service from Cairns to Green Island. 1930 Kitty & Noel Monkman, pioneers in underwater photography and videography, moved to Green Island. During WW II they acted as volunteer air observers. 1932 Cairns Town Council was granted a license to remove coral from the Green Island reef flat to make lime for mainland cane fields (operated until 1945). 1934 Green Island declared a Fauna Sanctuary. 1936 Management control of Green Island changed from Cairns Town Council to the Queensland State. 1937 Green Island was declared a National Park. World’s first glass bottom boat launched. Research facility built (now Dept. of Primary Industry Research Laboratory). Hayles was granted the first 20-year lease to develop a hotel with tourism activities. 1942 The first hotel, Coral Cay Hotel, was constructed by Hayles. 1946 Jetty was reconstructed after being destroyed by cyclone. 1954 World’s first underwater observatory opened. 1963 Redeveloped hotel, the Green Island Reef Resort, opens. 1964 Crocodile Farm opens – the first ever on an island. Renamed Marineland Melanesia in 1972. 1970 Queen Elizabeth II visits Green Island on her 44th birthday – as part of her tour that followed in Captain Cook’s footsteps. Sandbag retaining wall built near jetty to protect resort land from erosion. 1974 Green Island Reef declared a Marine National Park by the Queensland Government. 1981 Green Island Reef zoned a Marine National Park ‘B’ with a Buffer Zone under the Great Barrier Reef Marine Park Act (extending 500m out from edge of reef). 1982 Daily fast catamaran service from Cairns commenced by Hayles Pty Ltd.
1988 Dreamworld Corporation purchased Green Island Reef Resort and ferry services from Hayles Pty Ltd and renamed the company Great Adventures. 1989 Green Island Reef Resort closed due to disrepair. 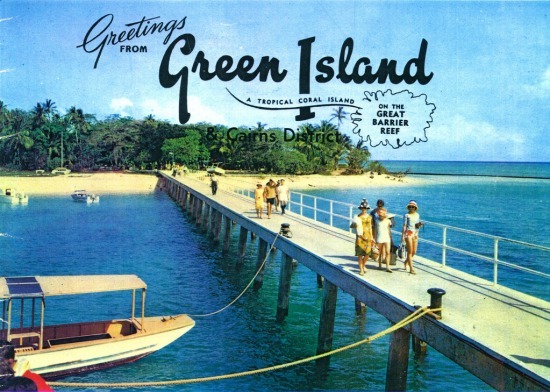 1991 Daikyo Pty Ltd purchased the resort and ferry service on Green Island from Dreamworld Corporation. 1992 Redevelopment of Green Island Resort and day facilities commenced. 1993 Redeveloped day facilities opened to the public. 1994 The Green Island Resort luxury accommodation opened. 2001 Green Island Resort desalination plant operational – producing over 55,000 litres of freshwater daily. 2005 Quicksilver Connections acquires Great Adventures and Green Island Resort from Daikyo Pty Ltd.